One of the things I dread the most in my household is dirty laundry. I'm sure I'm not the only one who feels that way. Laundry can sometimes feel like such a daunting task, especially when those piles of clothes just keep growing in my laundry room. My husband doesn't seem to fill the hamper compared to me so this chore is mine to take care of in the house. As a fashion blogger, I'm currently receiving and buying a ton of clothes on a weekly basis: of course, that means larger laundry piles in my house. I guess that's the downside of wearing a lot of clothes as my job, since I have to wash them right after I use them for shoots or events. I did learn a few tips to help me keep up with my laundry and I'm inviting you guys into my laundry room and sharing those tips with you. If you are not a fan of laundry and need help tackling those piles, then these tips are for you. To me, this one is a no-brainer. Finding a good detergent that's effective is key to minimizing the laundry piles. In the past, due to non-effective detergents, I've had to re-wash clothes because either they didn't come out of the washer smelling fresh or the stains didn't come out. So back to the laundry pile they go! I recently picked up the Persil® ProClean® laundry detergent trial size from my local Target®. It's formulated with Pro10 technology to help remove stains and delivers a premium clean. I'm in love with this detergent because it smells amazing and it has been giving my clothes long lasting freshness all while getting the job done. It's a stain fighting, whitening, and brightening detergent I'm recommending to you guys because it definitely makes laundry time easier for me since it gets the job done after every wash. I love that Target® has a trial size of Persil laundry detergent for $1.99: don't let the size fool you because this trial size baby gave me 6 loads! The trial size is perfect for you guys to try out. 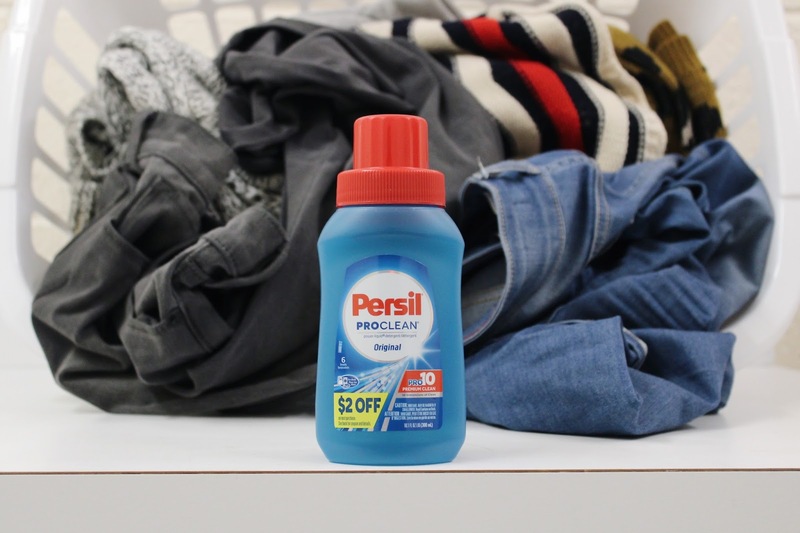 You can also use the $2 coupon on the bottle for any future Persil laundry detergent purchases. I admit I used to be one of those people who would let the laundry pile overflow until I thought it was time to do laundry. I think one tactic that's helped me tackle laundry better is if I see one load’s worth I do it right away. It minimizes piles and laundry time does not seem so overwhelming. It's easier to do one load every few days than a ridiculous amount of clothes in one day with multiple loads. I know sometimes I can get busy at any part of the day but I try my best to fold and put away the laundry the minute my clothes are dry and done. It's easier to accomplish putting away one load as opposed to multiple. Seeing a large pile of clothes to put away makes me want to run out of my laundry room quick. So instead of accumulating a couple of dry clean loads, I'll do them as they come out. How do you guys tackle laundry? Do you dread it like me? Hope you guys give the Persil laundry detergent trial size a try. 6 loads for a trial size sounds perfect to me! Creo que eres la única chica que se ve divina y bella mientras lava la ropa. You are so cute babe!